If you are a typical American, the answer is probably NO. In order to properly answer this question you should do a comprehensive financial plan with a Certified Financial Planner (CFP). If you do not have the time, money or desire to engage a CFP professional, the second best approach is to use a rule of thumb. Like any rule of thumb, it is a matter of opinion. It can, however, shed some light to the question above. Am I on track or not? Fidelity Investments recently put together this tool. In my opinion, it is useful to get the retirement conversation started. It lists different ages and the target level of Net Worth (Assets minus Liabilities) as a multiple of the annual gross income. This table applies to middle class workers with incomes typically between $60K and $100K. Lower income individuals need to save less because Social Security and other government programs are likely to cover a higher proportion of their retirement income needs. In case of higher income individuals, the multiple is actually higher because social security will only cover a small share of retirement income needs assuming that the retirement lifestyle is similar to the lifestyle during regular working years. The specifics for each individual vary, but in order to hit these numbers investors generally should save about 15% of their income and invest at least 60% of their portfolio in stocks. Being mindful of investment costs and taxes also has a major effect, especially in the long term. One can actually stop working at any age if the amount of wealth is large enough. In this case the investment returns equal or exceed the income requirements and the portfolio retains its real value indefinitely. This amount is estimated to be between 35 to 50 times yearly expenses. So, if an individual spends $100K per year, he or she can be confidently considered financially independent with a net worth of $5 million or more. When one is financially independent, work becomes a choice and not a necessity. This year, 3 different types of transit service either opened or expanded in Arlington County, offering new ways for residents, employees and visitors to get around. The Silver Line, which opened at the end of July, has provided an important connection between the Tysons Corner/Reston area and Arlington, DC and Maryland. The ART 43 bus route opened this past March, and offers express bus service during rush hour between Courthouse, Rosslyn and Crystal City. Finally, Capital Bikeshare continues to grow in Arlington and around the DC region, offering more stations and bikes for users seeking a fast and convenient one-way trip option. As mentioned in recent news, the Silver Line has already seen significant ridership within the 2.5 months since opening to the public. The new Metrorail service is already at 60% of the projected ridership for the end of the first year, with an average of 15,000 riders boarding each weekday throughout the 5 new stations. While the majority of riders have come from the Orange Line, Metro says about 6,000 new riders have started using the Metrorail system due to the new line. 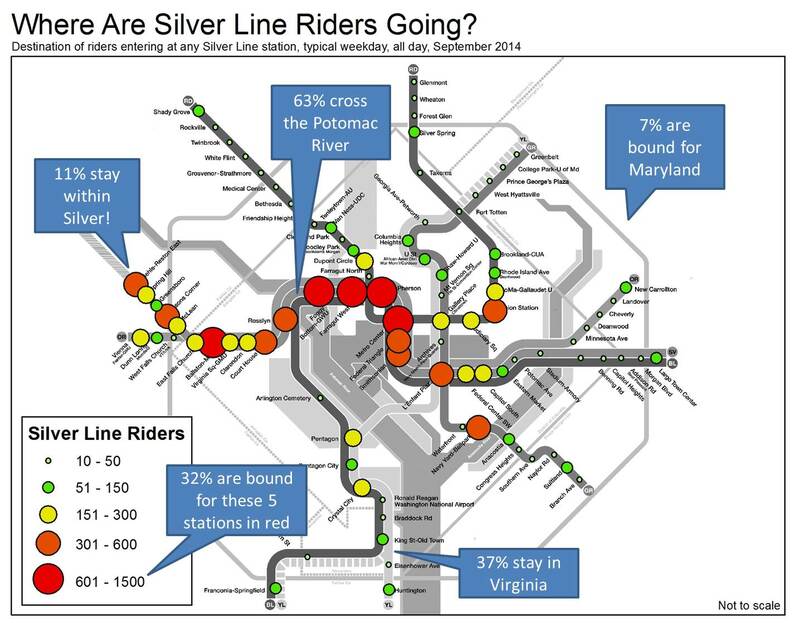 A recent blog post from PlanItMetro looks at recent ridership data to show where Silver Line riders are actually headed. While a little over half of riders head into DC, nearly 37% of riders stay in Virginia, particularly Arlington. In fact, Ballston is the 3rd most popular destination station for Silver Line riders, after the Farragut West and McPherson Square stations. According to PlanItMetro’s diagram, between 1,300 and 3,300 Silver Line riders are traveling to stations in the Rosslyn-Ballston corridor each day. Metro projects ridership to increase over the next year, as new residential communities in the Tysons area open up and businesses continue to flock to more urban office markets. While the Silver Line has many benefits for those who work or live in Arlington, the Blue Line between Rosslyn and Crystal City has seen a reduction in trains due to capacity restraints in the tunnel under the Potomac River. The ART 43 was introduced as an alternative for Blue Line riders, with buses serving a limited number of stops every 10 minutes between Crystal City, Rosslyn and Courthouse during the morning and afternoon rush hours. The route also gives riders a 1-seat ride option, instead of having to switch Metrorail lines at Rosslyn. According to Steve Yaffe, ART’s Transit Operations Manager, the ART 43 has seen ridership steadily increase since opening, with nearly 300 riders per day taking advantage of the service. In addition, ART has seen numerous requests for more frequent and expanded service on the 43 route. Capital Bikeshare continues to grow in popularity throughout the DC Metro region with 337 total stations in the system and over 26,000 annual members. In the past year, Arlington has grown to 74 total stations and over 500 bikes, with an increased presence in the Columbia Pike area as well as new stations in Crystal City, Rosslyn and Ballston. According to Arlington County’s FY2014 Summary Report on Capital Bikeshare, the number of annual members in Arlington increased 31% from the previous year, and the number of trips that started in the County increased 24%. These trips accounted for nearly 379,000 miles traveled on Capital Bikeshare in the past year – clearly an important transportation option for residents, employees and visitors in Arlington! Arlington recently released plans for expansion of Capital Bikeshare within the County for the next 6 years, with a total of 137 stations by 2021. These transportation options are an important part of Arlington County’s transportation network and will continue to grow as more residents, jobs and tourism flow into the County. Whether you are an employer or property manager, encouraging the use of nearby transportation options can make it easier for your employees and tenants to get to work, home and other destinations. If you’re looking for updated maps of the Silver Line, new bus routes for ART 43 or just need some additional information on Capital Bikeshare – Arlington Transportation Partners can help! Email us at solutions@transpartners.com and we’ll deliver free maps to your business, residence or property. It’s free. Seriously. ​For even more information from Arlington Transportation Partners, visit our blog to receive updates, news alerts and more. Did you know Arlington has one of the largest populations of 25-34 year olds in the region? According to a study performed by Arlington Economic Development, 45% of the current Arlington population is comprised of young professionals. What does this mean for our community? The young professional population will not be dwindling anytime soon. Arlington has one of the fastest growing young professional populations. How can we ensure that these young professionals become an active part of our community? Their voices and opinions shape Arlington’s future.As the Baby Boomers retire from upper-level positions, there are not enough Generation X’ers to fill their spots – nor do they necessarily want to hold the upper-level positions. As a result, young professionals are moving up the ladder quickly. Arlington is fortunate to already have a sufficient crop of trailblazers who are showing impact personally and professionally through their exceptional leadership. Celebrating these devoted leaders who are committed to making our community a better place to live and work helps to inspire their successes. Young professionals in our area are already developing strong social and intellectual capital in the region. Kate Roche was promoted to the President & CEO of the Arlington Chamber of Commerce at the age of 29, following the retirement of Rich Doud who had been with the Chamber for over 23 years. “I have a lot of drive in me,” Roche stated in an interview with The Washington Post. “Anything I do, I’m going to do to my utmost ability.” The community’s reaction to such a young Chamber President was extremely positive. Arlington is ready for our young professionals to shape the community. Additionally, young professionals are focused on making meaning, not just making money. According to Roche, “One of the things going through the search process [for a new Chamber President] that they said made me stand out was my true passion for the organization. I feel so strongly about the Chamber and all the great work we do, but I would never work anywhere where I didn’t feel strongly about the mission and what the group was doing.” This is a common characteristic among young professionals. Leadership Arlington believes that our community is filled with enlightened, inspired and connected leaders. As an initiative of this organization, it has formed a regional Young Professionals. These are our next generation of leaders, and they are a valuable resource. The future successes of our community rest on our investment in our young professionals. Program to jumpstart their community engagement and civic and philanthropic involvement. From 2000 to 2010, the young professional population in the Rosslyn-Ballston corridor alone jumped 44%. Between 2007 and 2013, Arlington saw this population grow 82%, the largest increase in the county. These are our next generation of leaders, and they are a valuable resource. The future successes of our community rest on our investment in our young professionals.